10 November 2016: Article reproduced below from the Evening Standard’s property section about a proposed new development, just outside of London, designed to deliver ‘no energy bills for inhabitants‘. London’s new planning rules for zero carbon homes, introduced on 1 October 2016, could provide the framework to deliver similar such developments in the capital. A revolutionary residential tower being built in Hemel Hempstead offers sustainable and affordable luxury living – without any energy bills. Prices range from £218,000 for a starter home to £1 million for a penthouse in the 17-storey tower, which will have 272 studio, one-, two- and three-bedroom balconied apartments and penthouses. Touted as the “world’s most sustainable development” by Lumiere Developments, the eco-credentials of tower, which is due to be completed in 2018, are not only impressive but promise to offer buyers free energy for life. Electricity will be generated by embedded solar panels at each floor level, making it the highest density solar farm in the world; hot water will be provided by ground source heat pumps and rainwater will be harvested for toilet flushing as well as irrigation of the UK’s tallest indoor arboretum, which will keep the internal air fresh. The apartments are triple- or quadruple-glazed and hot water is provided by ground source heat pumps which extract heat from the basement of the building, while air source heat pumps extract heat from the atrium. There will be an internal arboretum, café, bar, club lounge and cinema room, plus a gym for which membership is included within the annual management fee. There’ll also be a communal roof sky garden, as well as electric car and electric bike hire schemes for residents. The tower will be bordered by 400 acres of green belt land, and Hemel Hampstead station, with direct links to Euston within 24 minutes, is within walking distance . November 2016: The London Assembly Environment Committee will be holding an oral evidence session later this week – Thursday 10 November – on home energy efficiency progress in London, and the challenges faced by Londoners living in homes suffering from fuel poverty. An outline paper prepared for the Committee is available here – and the 10am session will be webcast on the following link. Evidence will be provided by National Energy Action, Friends of the Earth and the Energy Saving Trust. Leonie Cooper AM In London there are as many as 348,000 fuel poor homes. There is also a clear pattern of increasing depth of fuel poverty in older households. Given these terrible statistics, what action will you take to protect pensioners this winter? Sadiq Khan (Mayor of London): Thank you for taking this question, Dr Sahota. I am hugely concerned about the levels of fuel poverty in London and its increasing depth amongst older households, which is a national trend and is extremely worrying. I am committed to taking much more of a leadership role. I will look at ways to better target fuel poverty measures in London and produce a Fuel Poverty Action Plan for the capital. November 2016: Congratulations to student group Solar SOAS who successfully achieved their crowd funding goal earlier this year raising £22,000 for their PV project, which has now successfully installed 114 solar panels on the roof of their university building. Funds were raised from SOAS itself, the students’ union and individual donors, and Solar SOAS co-founder Hannah Short said that crowdfunding the project provided “a rare opportunity for interested stakeholders to become part of a climate solution”. Solar SOAS are having a ‘solabration’ tomorrow evening at the Brunei Gallery to formally launch the project – full details of which are posted here. 6 November 2016: The Evening Standard reports that electronic signs at bus stops and Tube stations will warn Londoners of dangerous air pollution levels. The signs will feature at all 270 Tube stations,and with 2,500 signs at bus stops and 140 “dot matrix” signs on the capital’s busiest roads. Read the full report here. Full Evening Standard article here. See earlier post on GLA ‘Green Capital’ study here. November 2016: The Mayor is to “undertake a natural capital account for London parks and green spaces. Natural capital accounting is a methodology developed by the Natural Capital Committee on behalf of the Department for Food and Rural Affairs (Defra) to establish an accounting framework which values some of the intangible benefits of the natural environment. The full GLA approval document can be accessed here (or directly downloadable here). The Green Infrastructure Task Force report can be downloaded here and some further background to the Taskforce is available an earlier post here. “The Tate wanted the environmental design of the Switch House extension to London’s Tate Modern gallery to be as cutting-edge as the art installations it showcases…Max Fordham’s scheme does not disappoint. It uses ground water pumped from river gravel below the site, desiccant dehumidification and even waste heat from electrical transformers to create the ideal environmental conditions for the Tate’s priceless works of art, while ensuring millions of visitors are comfortable.” Read the full case study here. Tate Modern’s energy programme was supported by the London Energy Efficiency Fund – see earlier post here – and last year, a solar PV array was also added to the building. whether an annual planning and energy assessment report will be published; higher energy costs for Londoners due to the Hinkley go-ahead; solar action plan consultation; supporting community energy projects through the Zero Carbon Homes policy; Energy for Londoners budget; the number of zero carbon homes projected to be in place in 2025 in the London Energy Scenarios report; the Mayor’s support for the Energy Bill Revolution campaign; the use of biomass in large scale centralised coal generating plant which supply power to London; the proposed increase in business rates on solar PV installations; supporting the Zero Carbon Homes policy in future revisions to the London Plan; supporting boroughs in the implementation of the Zero Carbon Homes policy; the range of options open to developers to meet the Zero Carbon Homes target; how forthcoming revisions to the London Plan will support the Zero Carbon Homes policy; the Energy Gardens programme and LPG conversion of London cabs. 7 October 2016: Following on from an earlier post about Havering’s Solar Parks initiative – comes further news on the borough’s ambitions, with a press notice that Havering seeks to become London’s first solar powered Council. In addition to plans to build two solar parks, which could have the potential of generating £1m annual income, the councils is exploring the potential for residents to directly invest in a sustainable future for the borough through a solar financial investment fund. Further information on the following Romford Reader article and Havering Council’s website here. 6 October 2016: Number of interesting recommendations made in thinktank, Future of London’s new report on climate change adaptation. 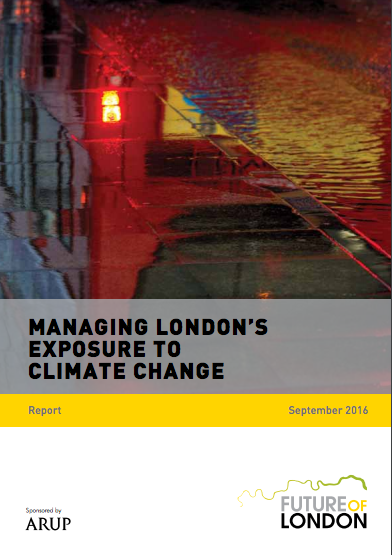 The report – Managing London’s Exposure to Climate Change – was launched at an event held at Arup’s offices yesterday morning. The GLA’s lead officer on climate change adaptation presented at the event and stated that a revision to the existing London Climate Change Adaptation Stragegy was currently underway – and would be issued for consultation in Spring 2017. Notes from a workshop ‘Funding Climate Change Resilience’ that fed into the report’s findings can be found here. The NLWA response echoes recommendations made by the London Assembly Environment Committee in their Bag it or bin it? : Managing London’s domestic food waste.